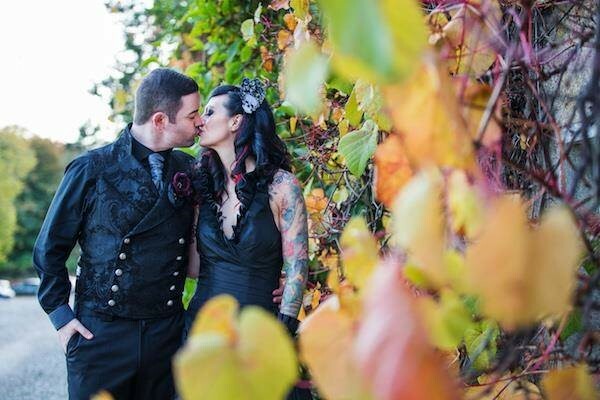 Everyone knows Halloween is the best time of year, so what better day is there to get married than October 31st? 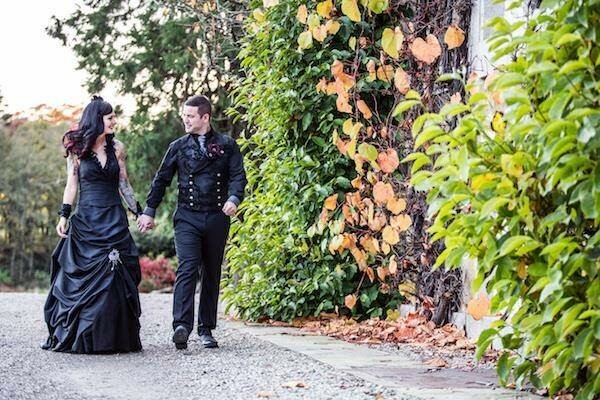 We grabbed a few words with Martin and Alli Hutcheon, who got married on Halloween in 2015; their thoughts and photos should provide some inspiration for anyone planning a wedding around Halloween this year! 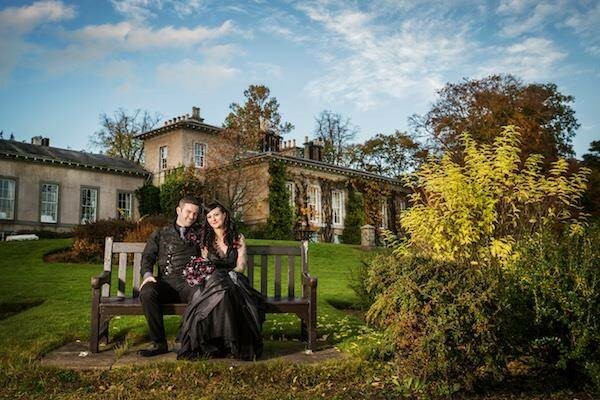 We’re Martin and Alli Hutcheon. 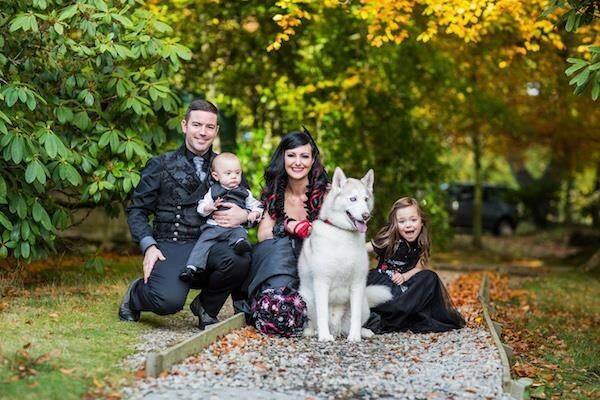 Alli is a former pole fitness instructor and now full time mum to our two wonderful children Shen and Hagan, and one husky Jed. Martin is a former addictions/mental health Social Worker who now works for a front line homeless charity. 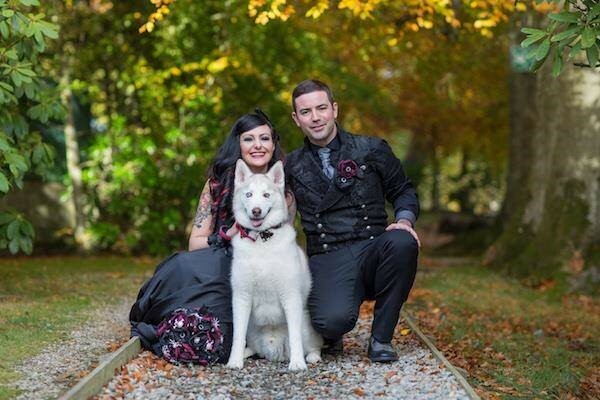 In our spare time we like to create little adventures for our children and we love to take our gorgeous Siberian Husky on long walks. We both have an almost obsessive love of horror movies and hauntings so will take any opportunity to binge watch horror films and take part in paranormal investigations of reportedly haunted locations. 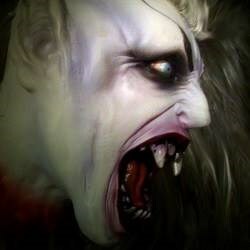 But our absolute favourite thing to do is indulge our love of zombies, or the undead in general, by taking part in zombie related games such as 2.8 Hours Later or Generation of Z where we can get our adrenaline pumping as we flee for our lives. 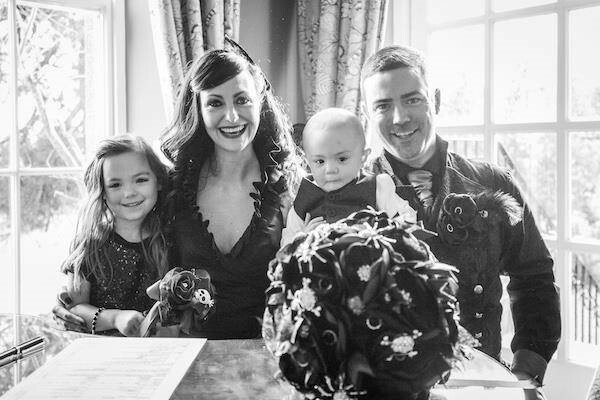 We were married on October 31st 2015. 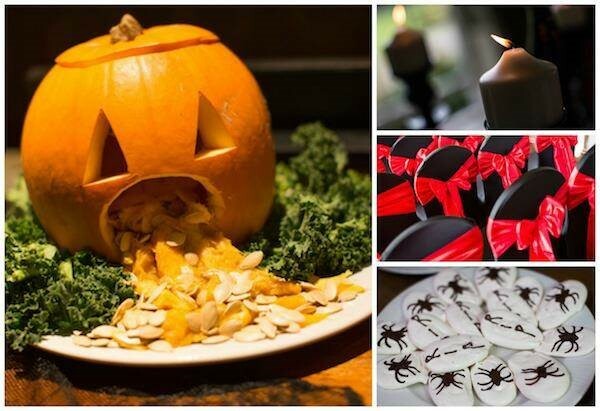 Our favourite day of the year, Halloween, at Thainstone House Hotel, Aberdeenshire. 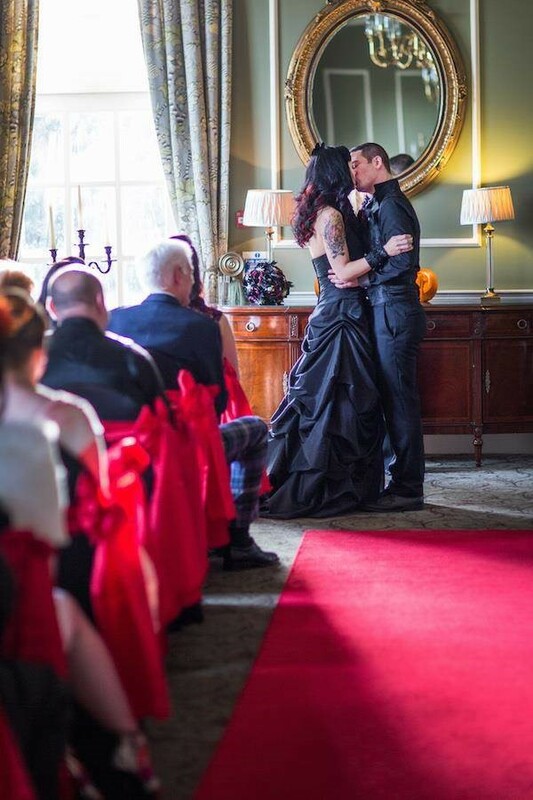 How/why did you decide on a Halloween Wedding? We always knew we wouldn’t have a traditional wedding and Alli always knew she wouldn’t be wearing white on our big day. So when it came to our wedding date there was no question. It had to be Halloween. 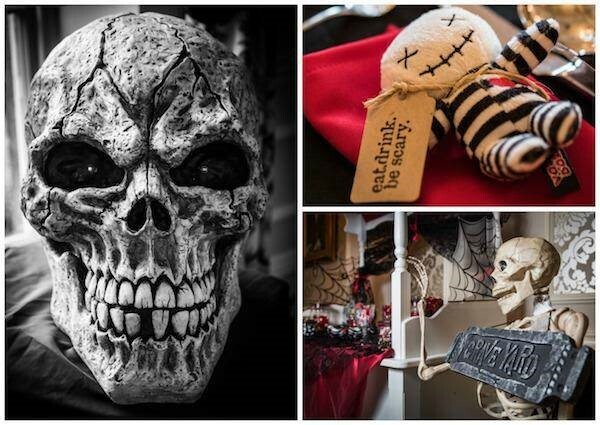 It was the perfect time to do things a little differently, indulge our passion for all things horror related, and allow our guests to channel their ghoulish sides whilst giving us freedom to have a few little surprises for them throughout the day. 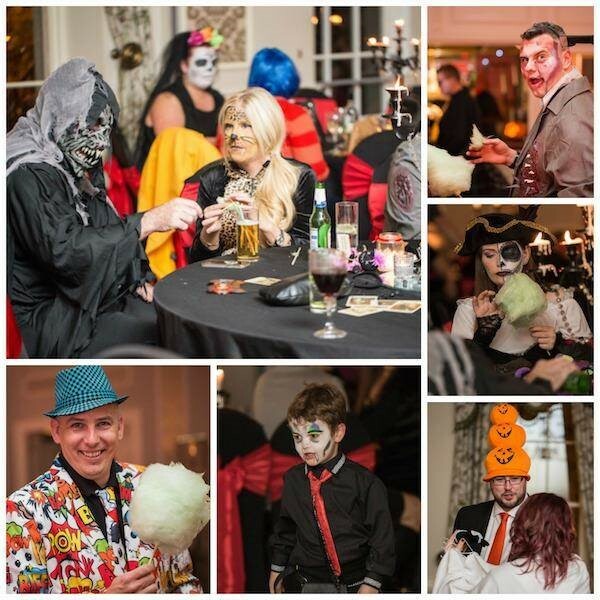 We both love anything to do with the sinister side of Halloween and thought the theme would be easy for everyone to get behind and allow everyone to have a little bit of fun with how they dressed for the evening, once the formal part of the day was past. 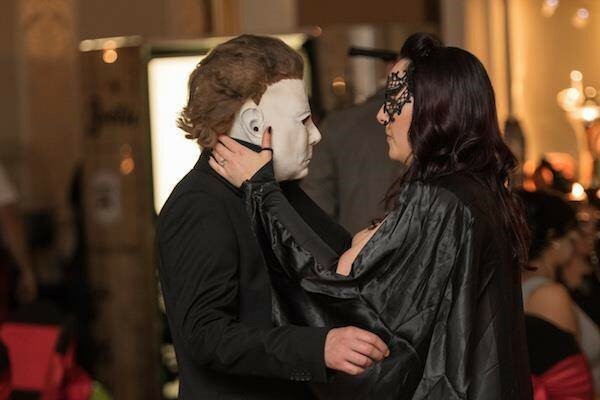 Did all your guests embrace the theme? Absolutely! 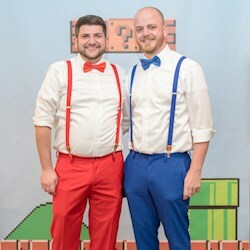 We were just over the moon with how every got right behind our theme for the reception. From age 2 to 92 the effort was outstanding. Face painters/makeup artists were on hand to help transform our guests into whatever creature they wished to transform in to for the evening. Just in case people weren’t able to bring a costume we provided some accessories and props but fortunately these were barely used as everyone came very well prepared for a spooky evening. 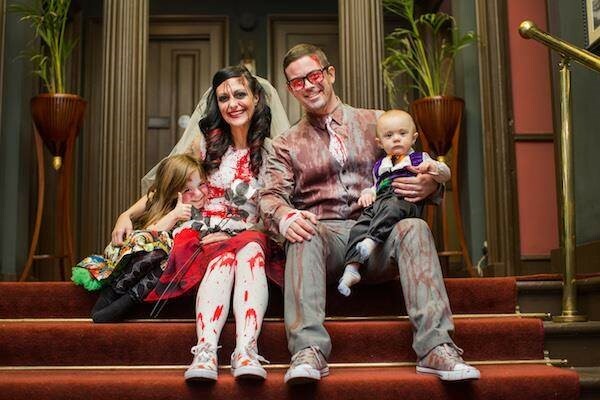 We were amazed that it wasn’t just the guests who embraced the theme. 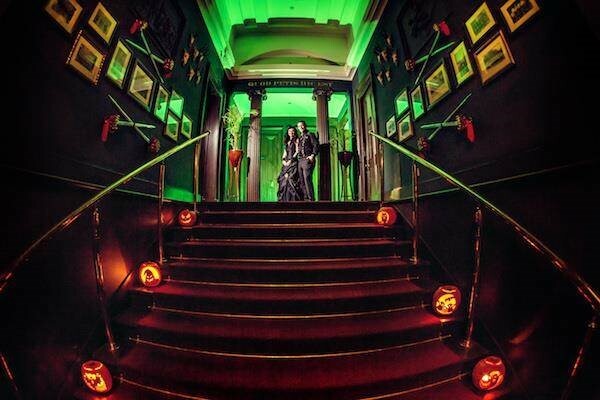 Our venue, and all their staff, got right in to the swing of things with custom decorations, lighting, costumes and some very lovely little Halloween treats for our guests. Your outfits are fantastic, could you tell us a bit about how you put them together? Alli knew she wouldn’t be wearing white and always wanted to have a black dress and rock the Gothic Princess look for the day. 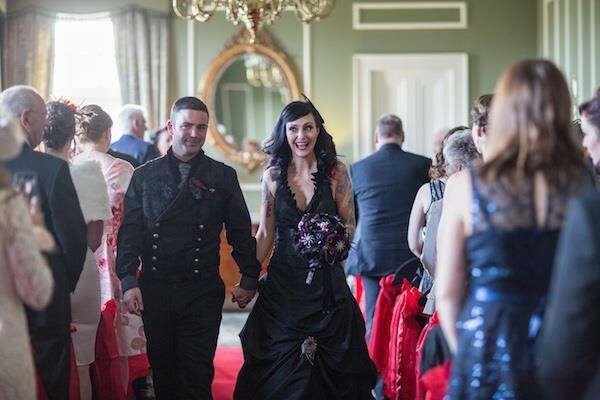 Unfortunately a black dress wasn’t something easily obtainable from the high street so after doing a lot of research online she came across the amazing designer Tova Marc from Wedding Dress Fantasy. They had a fantastic range of alternative styles and as soon as Alli saw her dress she knew it was the one. 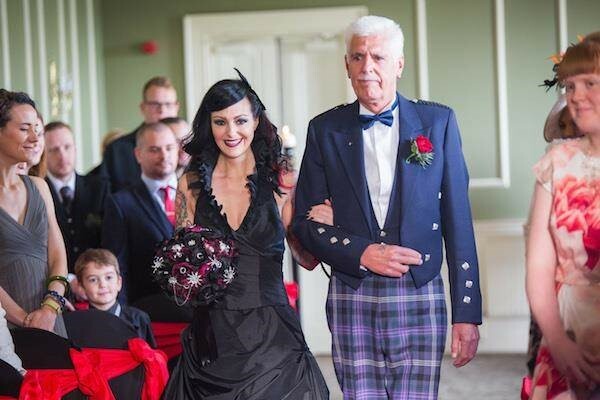 When it arrived it was perfect and Alli chose to add a few little finishing touches like a custom brooch and home-made fascinator to complete the look. 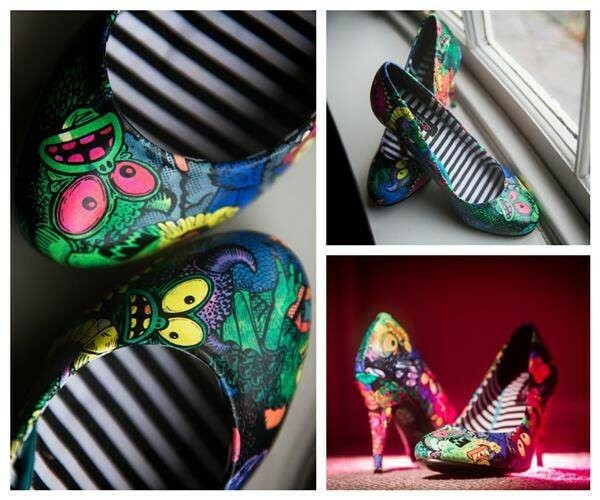 The shoes had to be the Iron Fist Party Monster heels that Martin had bought her for Valentine’s day a year or so earlier. 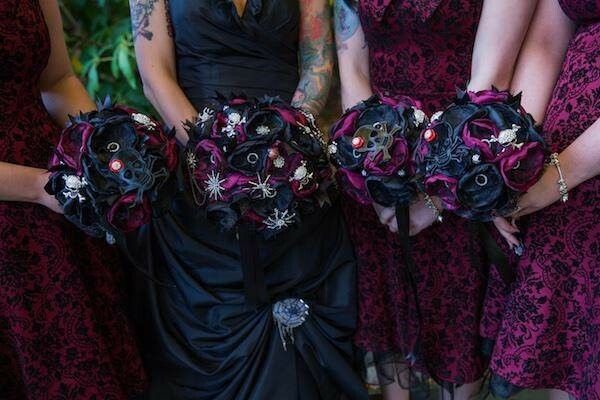 Alli’s flowers were custom made by the very talented Angel K Weddings to the Gothic Princess brief and really completed Alli’s vision of the perfect alternative bouquet. Martin wanted a restrained Gothic look for his outfit. For over a year had been longingly gazing at the Cavalier Vests from Shrine of Hollywood and no matter what else he looked at he always came back to that same black tapestry vest. To complement the vest he went with simple black trousers with black and grey shirt and shoes. 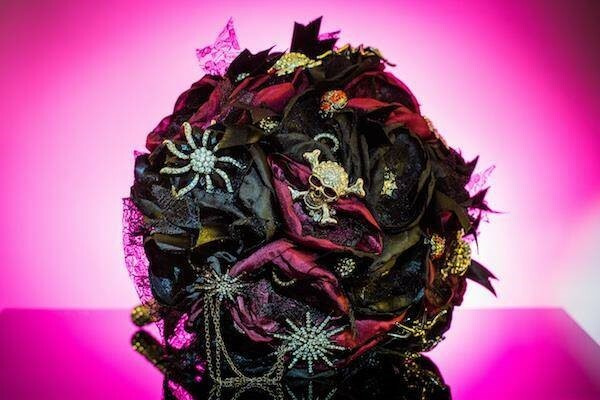 This was finished off with a custom and subtly flamboyant gothic button-hole by Angel K Weddings. How about the bridesmaids outfits? 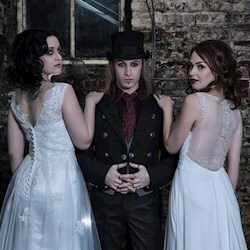 For the bridemaids Alli had a vision of a goth rockabilly look and searched high and low for the perfect dress to complement each of the bridesmaids. Alli stumbled across Pretty Kitty Fashion and spotted the Flock Swing dresses which she thought the bridemaids would love and fortunately the colour matched exactly what she pictured. 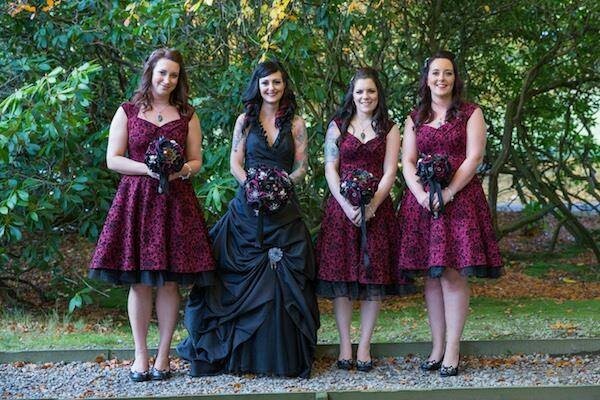 All three bridesmaids found the dress extremely comfortable to wear and rocked the look on the big day. 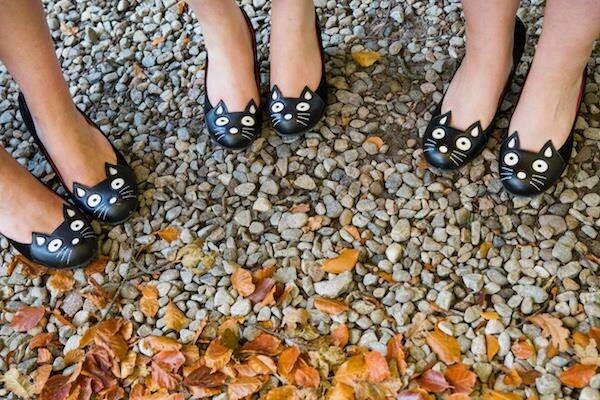 The shoes had to be something unusual, something with a little quirk, TUK cat shoes seemed the perfect choice as it wouldn’t be Halloween without black cats making an appearance somewhere. Their flowers were of course made by the fabulous Angel K Weddings and closely matched Alli’s own. 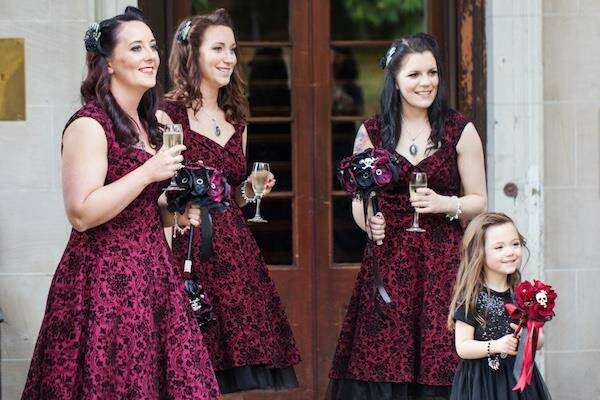 The bridesmaids' hair was finished off by spooky skeleton hand and black rose hair clips. Your cake looks out of this world, who made it? We had a pretty clear vision for what we wanted from our cake. 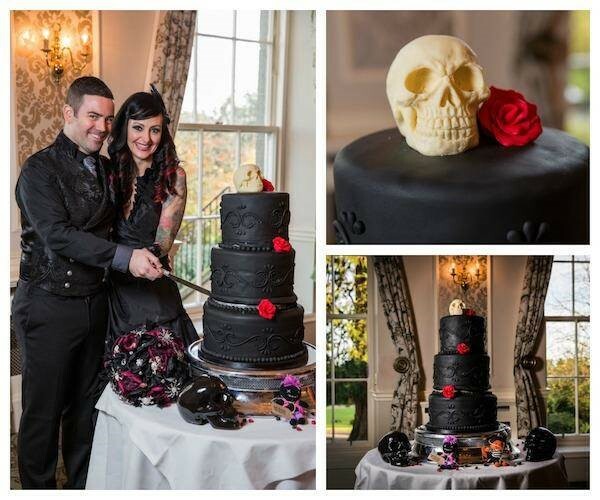 It had to be black, with gothic detailing, and it had to be red velvet as Martin’s a bit of a cake fiend. Fortunately a good friend is a very talented cake maker who offered to make this for us and did a fantastic job. We’ve got to say it was one of the most delicious cakes we’ve ever tasted and it certainly got a lot of attention on the night. 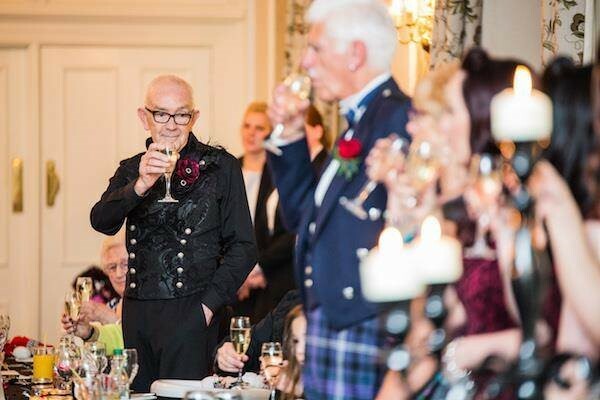 Our guests absolutely loved it and by the end of the night there were only a few crumbs left. Martin had a clear idea of what he thought Alli would love when it came to her wedding ring. 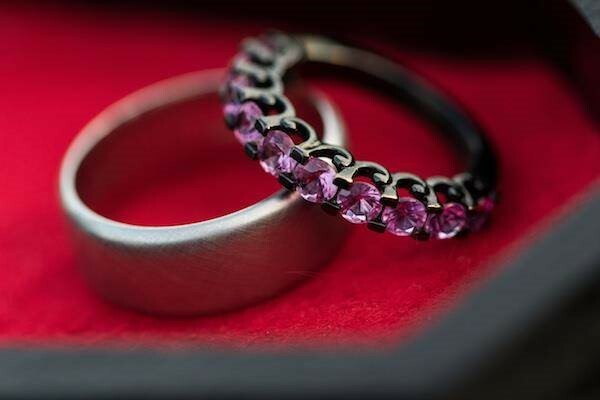 Having already sourced a Vintage style 14k black gold engagement ring with pink sapphires he knew he’d need something to match in perfectly. 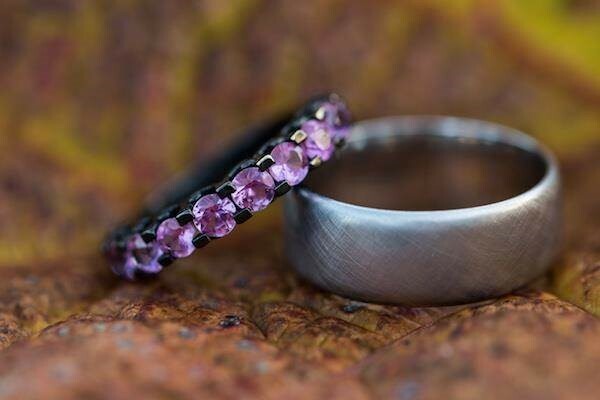 He contacted the designer of the original engagement ring, Art Masters, and requested they make a ring to match, which of course they were delighted to do. 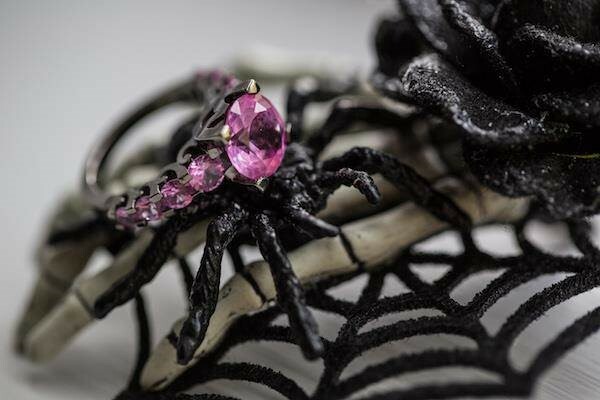 Alli loves how unique her rings are and feels the pink sapphires coupled with the black gold give an alternative edge to the traditional engagement/wedding ring. Alli loves showing off the rings and pointing out that the centre stone setting on her engagement appears to be an ‘M’ within an ‘A’ to match our initials. Martin’s brushed palladium ring came from local jeweller John Park whose reputation in Aberdeen is second to none. 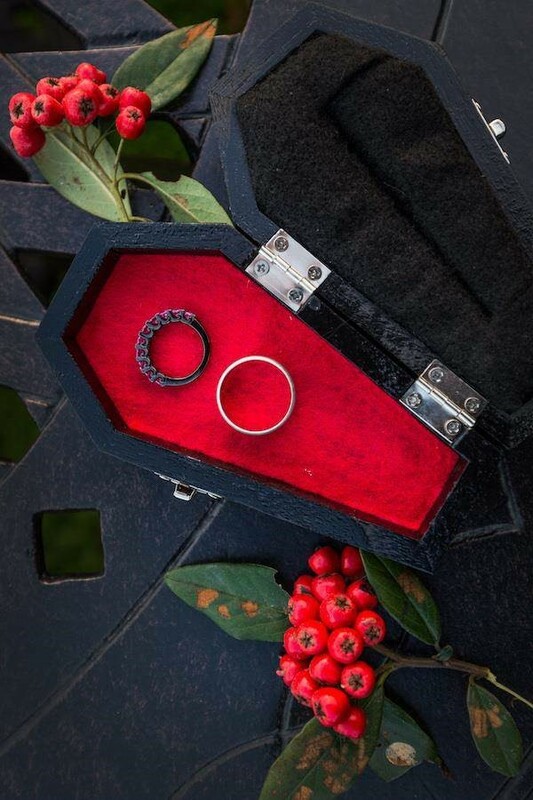 You just wouldn’t believe how difficult it is to find tiny coffins on the high street so our coffin ring box was another Etsy find, from Sugary Skulls Boutique. 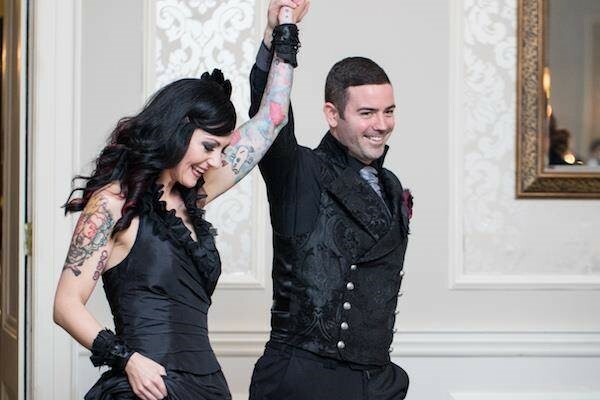 There are some great shots of your first dance, we'd love to know what the song was. Also, was your whole playlist Halloween themed? 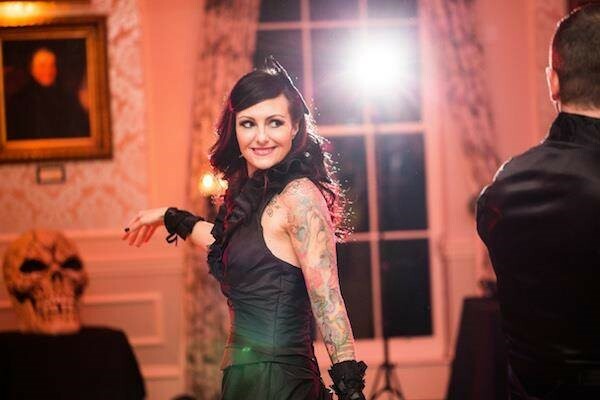 Our first dance was accompanied by Quivver’s – All Fall Down, one of Alli’s all time favourites for a number of years so it was her first choice of song when it came to picking a song for our first dance. We had taken some dance lessons on the run up to the big day and the song fitted perfectly with a few of the moves we had learned. 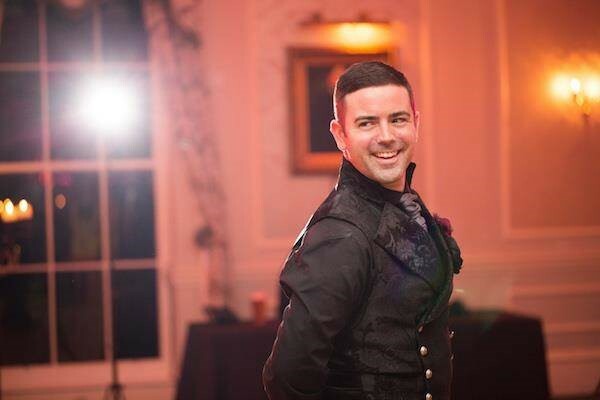 It was a great first dance song as it was upbeat but had a lovely haunting feel to it. 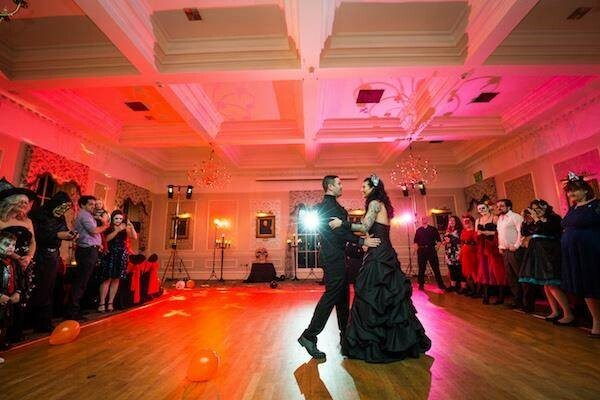 It certainly set the mood for the rest of the evening’s dancing and started off our reception perfectly. 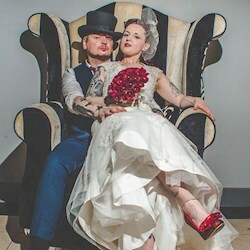 For our reception's playlist we decided to sit down and choose 20 songs each from our list of favourites, this quickly grew to 30, then 40 and continued from there. We share extremely similar tastes in music so there was a lot of crossover in our playlists, with each of us choosing a mix of classic Halloween songs, John Carpenter-esque film scores and various goth, metal, electro and industrial artists. 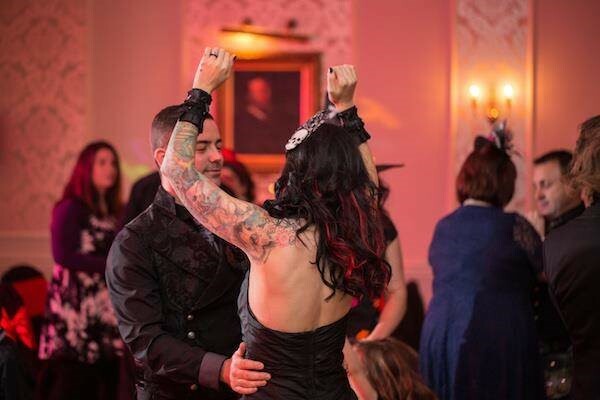 There wasn't a single traditional wedding song played that night but everything from Felix da Housecat through Gary Numan to Skinny Puppy and Ministry featured. 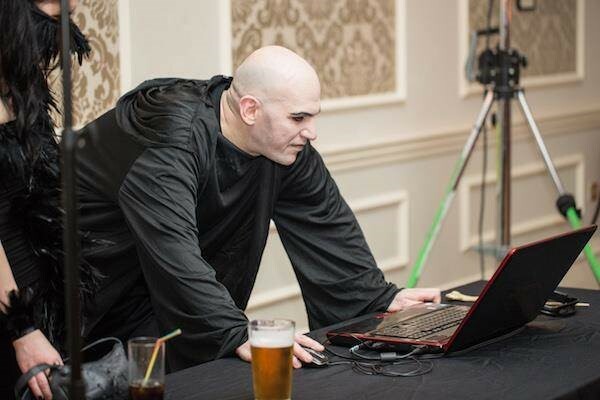 Our DJ, another good friend, works at Aberdeen’s tiki dive bar, Krakatoa, so was well versed in tying together what we requested be played with songs adhering to our theme but guaranteed to keep every guest up on the dance floor until the early hours of the morning. Jonathan Addie has a fantastic reputation and his work is unparalleled. We knew we wouldn’t trust anyone else but him capture our day, and all the little moments that came with it. From our pre-wedding photo shoot he made us feel so comfortable and at ease and really got on board with our wedding theme. For the big day Jonathan was everywhere all at once but in a completely unobtrusive manner and we feel it’s a credit to him just how many spontaneous and candid moments he captured. When he published the initial photos on his blog we must have spent days looking over each and every photo, even more so when he gave us the full set. He captured everything perfectly and every time we see the photos we can relive the day. Through his blog and Facebook page we certainly got a fair bit of attention and some wonderful comments from people far and wide. 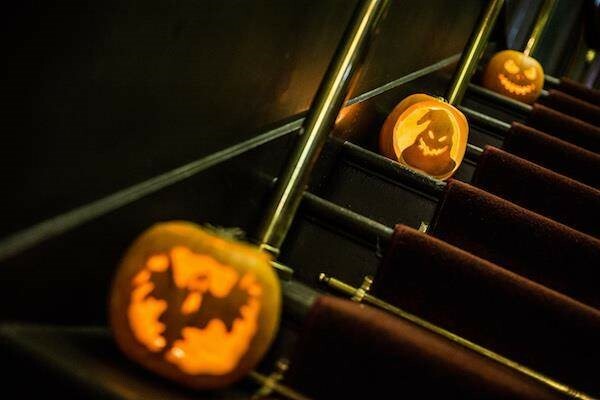 Our pumpkins were carved by the hotel staff and were a completely unexpected surprise. They really went above and beyond with their preparation for our wedding adding so many touches throughout the entire hotel. Was your wedding difficult to plan? Would you do anything differently if you did it again? 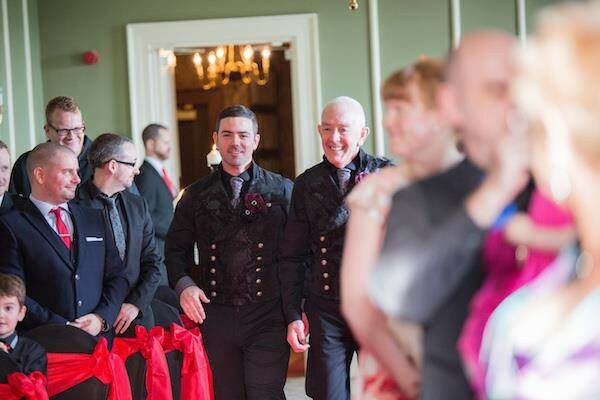 We wouldn’t say it was difficult to plan as we had so much help from family, close friends and the venue itself but it did become all-consuming in the run up to the big day. There were the usual blips along the way but fortunately despite a few minor setbacks there was nothing that derailed us or put a dampener on the day. 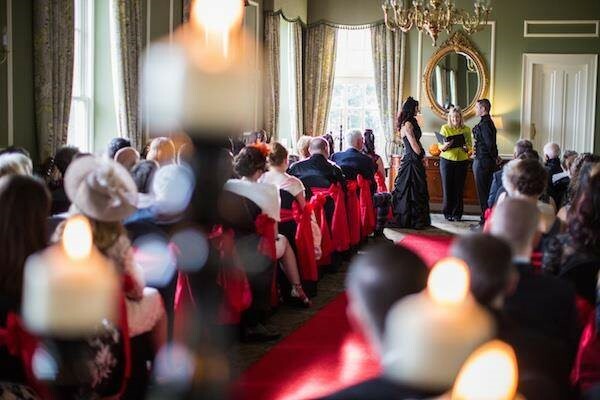 I don’t think we’d do anything any differently and we’re very blessed that the day went so smoothly and the atmosphere was electric from start to finish! Thanks Martin and Alli for sharing your day with us. 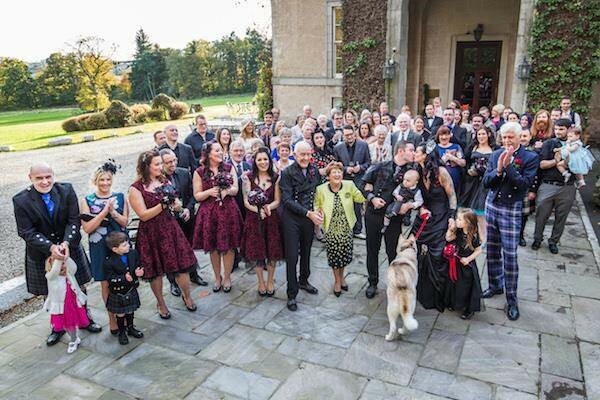 Congratulations on getting married and for pulling off such a fantastic wedding! Thanks also to the extremely talented Jonathan Addie for being kind enough to share his photographs with us. To see more of Jonathan's work, please take a look at his website.